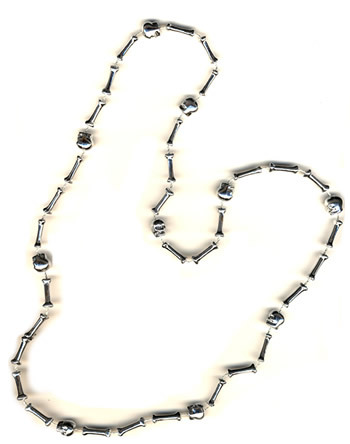 Skulls and bones silver 33" Mardi Gras beads. Lots of fun for Mardi Gras, funeral graduation, Halloween or Goth weddings, or pirate themed parties. Grab a handfull and have some fun! 12 - 35 Save $0.10 ea. 36 - 719 Save $0.20 ea. 720 - 5000 Save $0.25 ea.